The Wine Advocate - More masculine, backwards and concentrated, the 2005 Cote Rotie Chateau dAmpuis is a full-bodied, structured effort thats just barely starting to show some secondary nuances. Giving up notions of violet, asphalt, graphite, crushed rock, bacon fat and dried rose petal, it has impeccable balance, notable concentration and a big finish. It should hit prime time in another 2 to 3 years, and evolve gracefully through 2025. 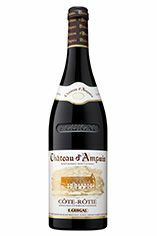 Parker - If the 2006 represents a 1991-ish feminine offering, the 2005 Cote Rotie Chateau d’Ampuis is a macho, masculine-styled effort. Dense, concentrated, and powerful, with gamy black currant, spice box, bacon fat, and herb notes, this chewy, tannic, enormously promising requires 3-4 years of cellaring, and should drink well over the following two decades or more.